Summer is a time for relaxation, endless afternoons, pool parties, and trips to the local library. It’s also great to have unscheduled time to explore, create, and play with science! Here are 5 quick science activities that can easily be done at home with materials around the house. At the end of the school year, it seemed like at least one kid per class period was rolling around a ball of slime. While occasionally distracting, it led to some great science conversations about how we learn to do things (YouTube!) and trying until you get it right. Slime takes some specific ingredients and finesse to get right, so don’t worry if you don’t get it perfect the first time — use this experience to learn from mistakes. 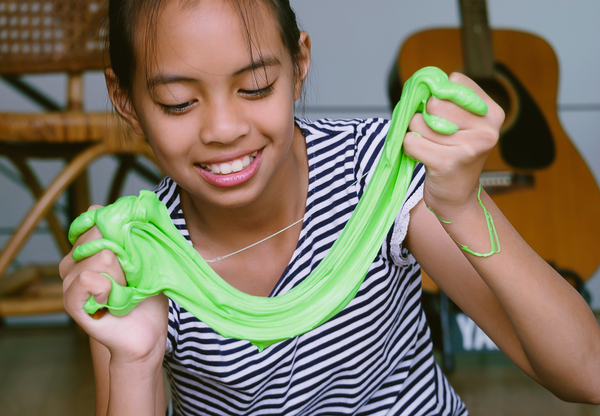 For something simpler, try the non-Newtonian fluid, Oobleck. Instructions: Watch this video for a walk-through. The key is to add in the borax/water mixture slowly. It’s easier to add more liquid than it is to add more glue. Instructions: Add 1-2 cups of cornstarch to a bowl. Slowly stir in water until there is just a little dry cornstarch left. Mix and adjust cornstarch and water levels. It’ll feel hard when you pick it up, and then it will slowly drip through your fingers. Put each powder in a plastic cup, label the cups A, B, C, etc. Put one spoon in each cup. Put each liquid in a plastic cup, label the cups 1, 2, 3, etc. Put one spoon (or one medicine dropper) in each cup. In dixie cups or on a plastic plate, mix one powder with one liquid. Make observations about what you see. Can you be a pen-detective? Who wrote that note telling you to skip your chores and go to the beach instead? Try coffee filter chromatography! Chromatography is a tool used to separate two or more substances. You will be able to separate pigments in different markers* with coffee filter chromatography. Dip the bottom of the coffee filter in water until the water begins to climb up and passes the marker lines. Remove the filter from the water and hold it upright. What did you observe? Are there any differences between the markers? *Did you try a Sharpie or other permanent marker, too? What happened? The human body is fun to learn about, especially when we’re not in school. Check out this infographic from Kids Discover to learn more about the human heart. It’s easy to observe what happens to our hearts when we are more and less active. This can be done indoors or outdoors, in any space. Traveling? Try it during an airport layover or at a rest stop on a road trip! You’ll calculate heart rate before, during, and after physical activity. Calculate resting heart rate: Find your pulse on your neck or wrist, use the stopwatch to count how many heartbeats in 6 seconds. Multiply by 10 to get beats per minutes (bpm). On a road trip? This step can be completed when you’re in the car, a few miles from the next rest stop! Complete a physical activity for 30 seconds. Outdoors: run through an obstacle course, run around in a big circle, swim laps or tread water in the pool, etc.. Indoors: jumping jacks, run in place. Find your heart rate immediately after completing the physical activity. Find your heart rate 1, 2, 5 and 10 minutes after the physical activity. Record your findings and compare days, times, and different people’s heartrates! Engineering is a hot topic! There are some phenomenal short videos produced by NASA and the Smithsonian that are great for kids and adults alike — spending some quality screen time on YouTube isn’t always a bad thing! Check out these videos: NASA for Kids: Intro to Engineering and My Path to Becoming a NASA Engineer. Some ideas for engineering challenges include popsicle stick bridges (materials: popsicle sticks and glue), newspaper structures (materials: newspaper and tape. Roll newspapers diagonally to make “struts” to build a structure), and any creation made out of cardboard. For older students, try using free online 3D modeling software, such as Tinkercad, to build a 3D model. Then, on your next trip to the local library, ask if they have a 3D printer available for students to use. For more formal engineering activities and lessons, read more here. Summer doesn’t have to be all video games and Netflix binges. Go out and have fun doing science!